Following a highly successful first season, season 2 of Seaguar’s Extreme Kayak Fishing Challenge kick starts January ninth on NBC Sports, as world-renowned big game kayak anger Jim Sammons hooks up with Ken Whiting and Jeff Goudreau on Wollaston Lake – one of the best trophy pike fisheries in the world. “NBC Sports Network is excited to be able to offer our viewers a second season of Extreme Kayak Fishing Challenge. The series presents this increasingly popular way to enjoy the sport of fishing in a unique and exciting way and it’s a great fit in our line-up of high quality outdoor programs.” Says Jeff Macaluso, Senior Director of New Media Programming at NBC Sports. Based out of the Minor Bay Lodge in Northern Saskatchewan, Jim and company experience some of the most incredible fishing action ever, catching hundreds of trophy pike in a single day. “I’ve heard people say that freshwater fishing isn’t nearly as exciting as saltwater fishing. 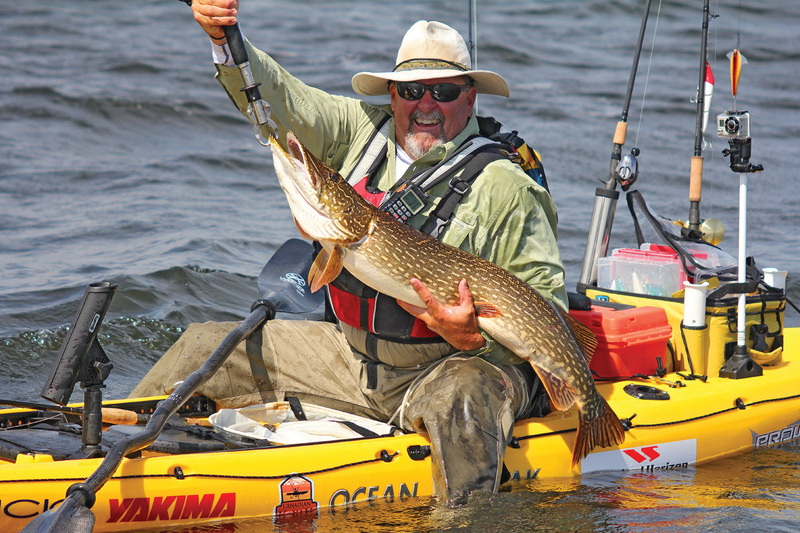 I’ll bet those people have never fished for monster pike up North.” exclaims Jim Sammons, host of Seaguar’s Extreme Kayak Fishing Challenge. About Seaguar: The inventor and world leader in fluorocarbon fishing line, has expanded its product offerings with the launch of Kanzen™ – an amazingly strong, smooth-casting premium braid line, and Senshi™ – a premium, clear monofilament line that provides the ideal balance of strength and sensitivity. About Jim Sammons: A San Diego California native and certified fish and game licensed guide, Jim is recognized worldwide as a pioneer of modern day kayak fishing and an expert big game kayak fisherman. With his trademark fedora and his role as the host of the Kayak Fishing Show on WFN, Jim has become the most recognizable kayak angler in North America. But it’s his infectious enthusiasm for the sport, his lively personality and his passion for sharing the sport with others which has made him the most popular kayak angler in the world. Well the date for the first airing of The Kayak Fishing show is only a few days away and too say we are excited would be a huge understatement. If you would like to see a bit more about the show take a look at this press release, sent out today. If you have not had a chance, take a look at our NEW KAYAK FISHING SHOW Website.which is filled with videos, and information about our trips, locations, sponsors, as well as the the guys we fished with. Look for this site to keep growing over the course of the upcoming year so book mark the site and visit often. I have heard from a few people that the show is not showing up on the TV schedule for Dish network, I have been assured that they are working on that and the show will be on, so no worries there. I plan on meeting up with some friends and family at a local sports bar to watch it, my cable company does not yet carry WFN. If your cable provider does not offer WFN at this time, please contact them and let them know you want it, it is your voices that will get us on more TV’s. You can also join our FB group People for the expansion of WFN to all cable providers, which is basically an online petition to the cable providers. I hope you all have a chance to see the show and enjoy it. I look forward to hearing what you think of the show.